The Walk-On’s Independence Bowl is hosting the second annual Rally on the Red in 2018, featuring three unique, upgraded and entirely-free events. Rally on the Red will be hosted the day before the game, Wednesday, December 26, and the festivities will kick off at 5:00 pm with the Pub Crawl. This year’s edition of the Pub Crawl will highlight 12 unique bars and restaurants throughout downtown Shreveport. Check-in will be in the Red River District, where attendees will receive a credential and list of locations. Special prizes will be awarded to different participants throughout the Pub Crawl. The final list of locations will be released at a later date, and up to date information can be found at WalkOnsIndependenceBowl.com and official Walk-On’s Independence Bowl social media accounts. As the Pub Crawl is making it’s way through downtown Shreveport, the much-improved Mardi Gras Preview Parade will start at 6:00 pm at the Louisiana Boardwalk Outlets. The parade, which will feature the two school’s marching bands, over 15 Mardi Gras floats and more, will then make its way over the Texas Street Bridge and into downtown Shreveport. It will continue through downtown Shreveport and end in the Red River District. The 2018 Mardi Gras Preview Parade will feature at least 10 area Mardi Gras Krewes and will be televised live on KTBS. After the conclusion of the Mardi Gras Preview Parade, the festivities will conclude with a trio of events in the Red River District. Following the parade, the two school bands will conduct a pep rally and battle of the bands at approximately 7:30 PM. 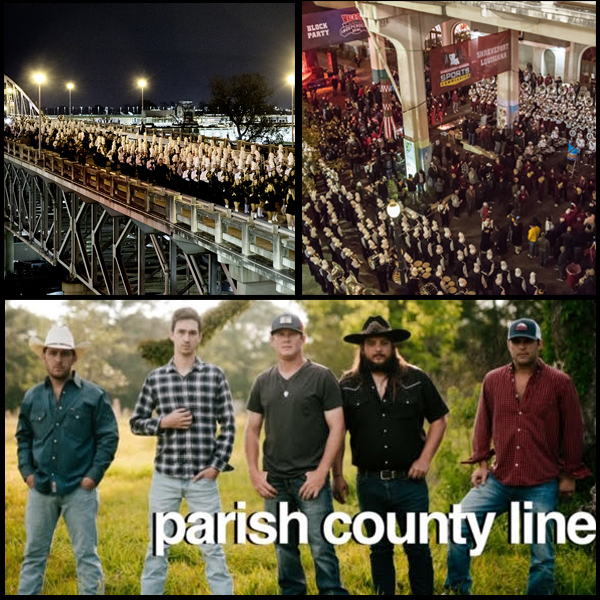 The Pep Rally and Battle of the Bands will be followed by the final event of the night, a free concert from the Baton Rouge-based country band Parish County Line. Beer and wine will be for sale in the outdoor area of the Red River District, with other offerings available in the surrounding businesses. Parish County Line is a country music band based in Baton Rouge, LA. They formed in 2012 when Derek Shipley of Centreville, MS met Travis Hood of Denham Springs, LA and decided they wanted to bring 90’s Country Music back to South Louisiana. It wasn’t but a few days later they formed Parish County Line. Shortly after forming, they were joined by Ross Pilcher (St. Francisville, LA) on lead guitar, and they added Trent Ciaccio (Baton Rouge, LA) on drums in 2015. At the end of 2017, they added Zach Stephens (Watson, LA) on steel guitar to really complete the “True Country” sound they had always been looking for. Their first EP was released in the summer of 2017, and the group has since taken the Baton Rouge music scene by storm, including winning DIG Magazine’s Greatest Local Band for the second year in a row. Things changed drastically for PCL after signing their first Official Sponsorship with Bud Light in 2017, and the future seems very bright for the boys. PCL has recently shared the stage with the likes of Diamond Rio, Tracy Lawrence, Dylann Scott and Kane Brown. The last few months the group has been focused on writing new songs and building an unforgettable on-stage performance. They are set to release their second EP in the late spring of 2019. For up-to-date information on Rally on the Red, stay tuned to WalkOnsIndependenceBowl.com and the official Walk-On’s Independence Bowl social media accounts. The Walk-On’s Independence Bowl is the 11th-oldest bowl game, set to play the 43rd edition of the game on December 27, 2018 at Independence Stadium in Shreveport, Louisiana. The Walk-On’s Independence Bowl enjoys primary conference agreements with the Atlantic Coast Conference (ACC) and Southeastern Conference (SEC), as well as backup agreements with the American Athletic Conference (AAC) and Conference USA (C-USA). The Walk-On’s Independence Bowl and Independence Bowl Foundation are prevalent in the Shreveport-Bossier City area throughout the year, hosting events to help enhance the economic impact and growth of our community. For more information, visit WalkOnsIndependenceBowl.com or follow the bowl on Facebook, Twitter and Instagram at @IndyBowl.